Title screen of this prototype build, unchanged from the title screen of Fire Emblem: The Blazing Blade. The prototype of Fire Emblem: The Sacred Stones is timestamped as May 31st, 2004, at 22:45:41, along with the name "KATAYAMA". This suggests that this particular build was assembled into a "playable" ROM form at this date and time by Makoto Katayama, a programmer credited in the finished game, which would date the build to roughly five months before the game's Japanese release. It is by far the most incomplete and prototypical of the three prototype releases: a very large amount of its content is straight unmodified from Fire Emblem, including even the title screen, and there is only the barest infrastructure for much of the completed game in place. A majority of the finished content is absent, including many portraits and new battle animations. This page dissects the differences between this build and the final version. A patch for the prototype can be downloaded here. Initialize File (Japanese: ファイル初期化) prompts the player to wipe all save data, but it does not appear to function properly. World Map (Japanese: ワールドマップ) starts the game from the world map screen. This mode skips all battles and instantly returns the player to the world map if they move onto a location with a skirmish or chapter on it. The last row is a chapter select function, where the player can press left and right to scroll through the game's maps and select one to start playing from. Is at least one hidden function to this. If a chapter is selected while L is being held tutorials are disabled for the loaded chapter. Within the prototype there are various debug menus that can be accessed in various ways. The soundtrack of Fire Emblem is completely retained with no modifications or additions. Obviously, none of it remains in the final version. None of the music present in the final release of The Sacred Stones appears to be implemented as of this revision. The vast majority of visuals are completely unmodified from Fire Emblem. The opening sequence and title screen are completely unchanged, including the "©2003 Nintendo" message. One feature not present in the final release with regards to the introduction and class roll is pressing the R shoulder button causes either to occur immediately instead of having to wait. The entire graphical interface is also unmodified; the exception is the newly-implemented world map interface, which as a completely new implementation comprises the only parts of the prototype to feature what would become the game's new interface style direction. For the most part, the game still uses the brighter, more saturated map tilesets of Fire Emblem. Some of its own tilesets have been implemented, like those of the Tower of Valni or Chapter 12B. Occasionally, postmark symbols are used as a temporary substitute for missing kanji which have not yet been programmed into the game. With a handful of exceptions, the prototype chapter maps generally match the layout of the finished chapter maps, but use the tilesets of Fire Emblem and are largely unrefined; additionally, many of the victory requirements are different from the final incarnations. All of the game's maps are accessible from the startup menu, the first thing displayed upon booting the game. The menu gives the options of commencing the game "normally", jumping directly into resuming a suspended game, formatting save data and, most usefully, selecting any of the game's chapters and maps to directly skip into playing. The opening cutscene skips the sequences with Fado in Renais Castle and Valter outside it, skipping straight to Eirika and Seth fleeing through the mountains toward Frelia. Instead of the three Fighters of the final version, the map here features only a single Soldier. Chapter 5 is largely the same, but the map has a very different layout to in the finished product. Saleh attacks Novala at the end of Chapter 6. Chapter 6 is the most significantly different map in the prototype. In layout it is identical to Chapter 11A of the finished product; curiously, at the start of the turn 5 enemy phase, the topography of the chapter changes significantly in what is likely a glitch. In the opening cutscene of the map, instead of depositing the hostage villagers into the range of a Bael, the boss Novala instead merely threatens to kill them in front of Eirika and, once she hands over the Lunar Brace, does so anyway. In the map's ending cutscene, Saleh appears and engages Novala in battle wielding the Divine tome, killing him with a critical hit. Curiously, in this fixed battle, Novala has no weapon equipped but nonetheless attempts to attack; he did have a weapon in the chapter itself. After Eirika's group and Saleh leave the area, Ephraim arrives with Forde and Kyle. All of the chapters from the Prologue through to Chapter 8 are mostly complete, with the full set of scripted events and cutscenes set up and working properly; though several things, like most of Chapter 6, were changed in the final game, the prototype's takes on the chapters were at a satisfactory point of completion. The same cannot be said of the rest of the game; from Chapter 9 onward for both Eirika and Ephraim, the chapters are rough and unfinished, featuring no scripted events or cutscenes at all, as well as unaltered Level 2 enemies possessing only their base stats and often wielding weapons they can't use. The maps themselves are little more than rough draft guides for working on the finished maps at a later date, sketching out the layout but not going into any substantial detail or polish. Some maps sport glitchy or unfinished tiles. The final chapter bears no resemblance at all to its finished incarnation. It is a near-direct copy from Fire Emblem, comprising the small room at the Dragon's Gate with the large door, used in The Blazing Blade as a cutscene stage in its own final chapter; it differs only in having several glitched animated tiles where torches were in the original. Like some other incomplete chapters, only a single enemy is present: the boss, a Level 2 Cavalier. The chapter's victory goal is merely to defeat the boss. Once this is achieved, instead of proceeding into credits or even crashing the game, the game then takes the player to the first level of the Tower of Valni. The debug map is a map apparently used as a testing grounds for the implementation of new abilities and features into chapters. In this build, it includes a couple of Summoners with the newly-implemented Summon skill functional, characters holding promotion items, enemy Gorgon eggs and several Gorgons, Revenants and Bonewalkers on both the player and enemy sides. The map features two houses along the top. The right house provides a view of every portrait inserted into the game at the time of the build, while the left house flicks through most of the build's maps, skipping the Tower of Valni and Lagdou Ruins. The portraits and maps are scrolled through by pressing the B Button. The Link Arena is listed on the startup menu and access can be attempted; however, doing so will always crash the game, possibly out of lack of positioning data for Eirika depending on how one interprets the debug monitor's error message. Three chapters do not appear in this prototype: Chapter 5x and both Chapter 11A and 11B. The layout of Chapter 11A does however appear in the prototype, in the form of its version of Chapter 6; it is likely that when Chapter 6 was changed into its current incarnation late in development, the old map was turned into Chapter 11A. On the other hand, the Tower of Valni now consists of ten floors, matching the Lagdou Ruins. For reasons unknown, Eirika is the subject of an unusual forced promotion event. If a player enters a chapter of the game through the startup menu, then completes that chapter and moves on to the next one, there will be an exchange between Eirika and Seth where they repeat the same message several times (pictured) before moving into the sequence to promote Eirika. The exchange is in the same style as the brief piece of dialogue which Ross, Amelia and Ewan have in the final game when promoting from their base classes, and is similarly forced at the beginning of a chapter before being able to do anything else; it is possible that this was a test of that same protocol. The message repeated by Eirika and Seth is "FE3ダミーMSG", which translates to "FE3 dummy message". Much as it implies, it is a dummy text string likely used to test dialogue boxes like this and appears in a few other places in the prototype. Here, "FE3" is presumably in reference to how The Sacred Stones is the third Game Boy Advance Fire Emblem title, and not in reference to Fire Emblem: Mystery of the Emblem, the actual overall third Fire Emblem game. In addition to being forced under these circumstances, the same thing is also set to happen at the beginning of Chapter 17, regardless of whether the player completed a chapter beforehand. This same happens to Ephraim if he is in the party, which generally only happens by accessing and completing Chapter 8 by this means. Support conversations are partially implemented, however, support points do not go up normally and must be forced through the use of the debug stat screen. Support conversations only exist for three pairs of units. SethxEirika, SethxFranz, and somewhat notably, EirikaxFranz, which, unlike the other two pairs, does not exist in the final release. There seems to be no actual support dialogue, and the placeholder text is virtually the same across all supports, saying level 1, 2 or 3 depending on if it is C, B or A rank, the placeholder text always specifically claims that the support conversation is between Seth and Eirika regardless of who is supporting who. No playable character or boss has a personalized palette for their battle animations, not counting Eirika. Additionally, unlike the Fire Emblem: The Blazing Blade prototypes, very few portraits exist in the game, with the entire set of Fire Emblem portraits completely removed. None of the few portraits which exist in the build have any eye or mouth animations. The majority of playable characters and all enemies use this placeholder silhouette graphic in place of a portrait. There appears to be some instability in how the game handles the classes of playable characters - certain maps load them in completely different classes to other maps for some reason; for example, Chapter 16 turns Moulder into a Bard and Colm into a female Thief. All playable characters introduced after Moulder and Vanessa do not have proper help descriptions and instead have a placeholder string which says "Undetermined" (Japanese: 未定). Though in the actual gameplay of the prototype he keeps his final Japanese name (エフラム), the index menu of the patch's debug functionality refers to Ephraim as "Irzark", suggesting that the obvious name change occurred some time before the time of this build. Similarly, even though Eirika's Japanese name is officially romanized as "Eirik" and her Japanese name, which is closer to that than "Eirika", is no different in the main game, the same index menu refers to Eirika as "Eirika". Amelia is the princess of Frelia in this build, completely replacing Tana. She has a unique class, the Apprentice (see below). Garcia is called Borba (Japanese: ボルバ), but is otherwise no different. Neimi is called Mary (Japanese: メアリ), and has no portrait. L'Arachel has Tana's portrait with a different and more blue-emphasising palette and L'Arachel's shirt, but is otherwise unchanged. Rennac does not appear to be playable, but in his appearance in the ending cutscene of Chapter 4, his class is Thief. This may be simply because the Rogue had yet to be implemented or have its map sprites designed. Joshua's role in Chapter 5 is filled by Cormag, who here is a Mercenary and does not have a portrait; he is still recruited by Natasha. Forde and Kyle have significantly different, though still recognizable, portraits from their final appearances; their colors were switched around at some point in the design process, as in this build Forde is the "green knight" and Kyle is the "red knight". Additionally, Forde is a Ranger. Innes appears as a Monk in the debug map and in his Tower/Ruins appearances, but also appears as a Sniper, his actual class, in Chapter 17 (Eirika variant). Nothing else about him is defined - he has no help description. The name and description for every boss; this one was Breguet in the final game. Tethys has a completely different portrait, one which bears a very strong resemblance to Neimi's from the final version. It is probable that once they decided to go with a completely different design for Tethys, they retooled their prior work into a portrait which was given to Neimi. Anna reuses her portrait from Fire Emblem; the final version uses an updated, recolored, and somewhat cropped version of this portrait, but is clearly based off her FE7 portrait. All bosses are lacking in portraits and other character-specific content; they are all called Evil (Japanese: イビル), have the help description "Grado soldier enemy boss" (Japanese: グラド兵敵ボス) and have the placeholder question-mark silhouette for a portrait. Every boss in the game lacks battle-starting dialogue and has the death quote "W-what... I am..." (Japanese: な なにい・・・このわしが・・・). Like the final version, the prototype reuses the generic soldier portraits of Fire Emblem; unlike the final version, said portraits have not been altered at all and the outline color is significantly different to that of every other portrait in the prototype. On the other hand, the prototype does not reuse the similarly generic villager portraits of Fire Emblem. Tirado does not exist; his role is occupied by Jude Rubert (Japanese: ジュード・ルーベルト), an individual calling himself one of the Seven Imperial Generals (in the final build, there are only six generals) and referred to by a shocked Seth as the "Obsidian" (Japanese: 黒曜石) (Duessel's title in the final build). He is ostensibly the boss of the chapter, but like all other bosses he has no personal data as a unit. The character was completely removed from the final version with Tirado taking his place. Eirika's famous preliminary battle sprite. All newly introduced classes (including the Priest) lack proper help descriptions and instead have a placeholder string which says "Undetermined" (Japanese: 未定). One of the most famous aspects of this prototype is its completely different battle sprite for Eirika's Lord variant. Though clearly recognizable as Eirika, practically everything about it is different from the finished product, and in general it is rather unrefined. Furthermore, the animation is not associated with any sound effects, so it makes no noises aside from when it hits an enemy. The map animation for Ephraim's Lord variant is complete, but as a placeholder reuses Eliwood's Lord battle animations; similarly, his Great Lord variant has complete map sprites but reuses the Knight Lord battle animations of the same game. Eirika's Great Lord variant merely reuses her unique Lord battle animation from this prototype. The Journeyman's map animation is complete, but it uses the Fighter battle animations. Furthermore, the trainee method of promoting upon reaching level 10 does not appear to have been implemented on it as of yet. When it does promote, the options are Fighter and Brigand, instead of Fighter and Pirate. Additionally, the class is called "Apprentice" (Japanese: 見習い; internally referred to as PROBATION_SOLDIER), which is the same name given to Amelia's prototype trainee class. Amelia has a unique class: the Apprentice (Japanese: 見習い; internally referred to as PROBATION_FLY_F), a flying trainee class variation on the Pegasus Knight. It can promote to either Pegasus Knight or Wyvern Rider. It uses the Falcoknight map animations and the Pegasus Knight battle animations. In the final product, it was effectively replaced with the Recruit, Amelia's class in her actual role as a Grado soldier. The Priest's map animation from The Binding Blade has been reimplemented, but its battle animations have not; it uses the battle animations of the Bishop. The Ranger has been implemented with a near-complete set of map sprites; its battle animations have not, and as a placeholder it uses the Nomadic Trooper animations. The General's ability to use swords has been implemented, but the animation has not; as a placeholder, it uses the Paladin's sword animation when using swords. The Great Knight has been implemented with finished map sprites; it also lacks battle animations, and so as placeholders it uses the Paladin battle animations for when it uses sword, and the General animations for lances and axes. The Summoner uses the Shaman map animations and Druid battle animations as placeholder graphics. The Summon skill is fully implemented, but the summoning animation is completely different from its incarnation in the final version: it uses the sound effect of the Light Rune, and the animation itself is identical to the prototype animation for laying a Light Rune in the Fire Emblem prototypes (the animation from the final version of Fire Emblem is a recolor of this). The summoned Phantoms use the Berserker map animation and Fighter generic portrait as a placeholder, and like in the final version have no battle animation at all. Unlike in the finished version, Phantoms have 20 HP and defense and resistance stats above 0. The Cleric retains the Serra-based map and battle animations it had in Fire Emblem; these were altered back to their The Binding Blade designs in the finished product. 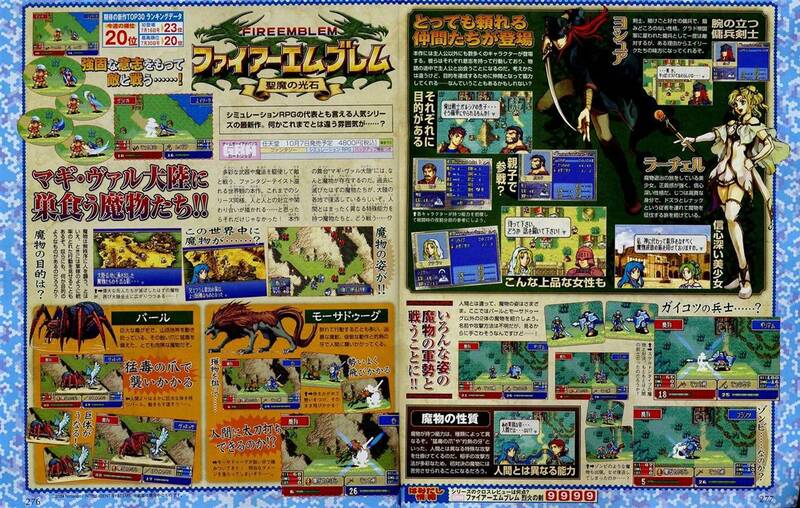 Female Archers retain the Rebecca-themed battle animations they had in Fire Emblem. The female version of the Mage Knight exists, appearing solely as the boss of Chapter 12; though no cutscenes are programmed in, it is almost certainly meant to be Selena. Its map animation is complete, but it uses the Valkyrie battle animations as a placeholder. The Berserker still uses its Fire Emblem map sprite; it was reverted back to The Binding Blade map sprite in the final version. An unusual class appears in the Eirika's version of the fledgling Chapter 9. It's labelled "Pirate" (Japanese: 海賊), and does possess the Pirate's battle animation, generic class portrait and minimum stats; however, it also has a D rank in using swords, and has the map sprite of the unpromoted Transporter of Fire Emblem. It is uncertain exactly what this was meant to be - whether it was just the Pirate with a few differences, or if it was perhaps a very early incarnation of the Fleet. Ephraim's chapter 10, where fleet units appear in the final release, seems to use Archers as placeholders for the fleet. The Necromancer exists, but has no complete graphics of its own; it uses the battle animations of the Dark Druid, and the map sprites of the Magic Seal. Leila's female variant of the Thief from Fire Emblem still exists, completely intact, as does the Bard. The prototype's Revenant and Bonewalker battle sprites, on the debug map. The Revenant, Entombed, Bonewalker and Wight are near-completely implemented. Like Eirika, here they have unique preliminary battle animations which, while definitely recognizable, are rather unrefined; in particular if a bonewalker attempts to use a magic sword, like the Runesword or Wind Sword, and animations are on, the game will softlock. The bow-wielding Bonewalker and Wight variants, do not have an animation and they use a Transporter tent as a placeholder map sprite, with no battle animation at all. Also, the Wight has a different name: while in the final Japanese version it is called ヘルボーン Hellbone, here it is called ヘルスケルトン Hellskeleton. The Mogall is implemented and has a complete map animation, but has no battle animations whatsoever. Their personal Evil Eye and Crimson Eye weapons do not exist yet, so some wield normal dark tomes while others have no weapons whatsoever. The Mogall's pseudo-promotion, Arch Mogall seems to be entirely absent from this revision. The Mauthe Doog and Gwyllgi and exist in a very rudimentary form. They use the Transporter tent for a map sprite placeholder, have no battle animations, have no usable weapons (interestingly, those which do appear are all holding unusuable Steel Axes) and attempting to view their help descriptions results in a small glitchy mess. The Elder Bael does not appear to exist in any form; its map sprite does, used as the map sprite of normal Bael. The Bael has no battle sprites. The Tarvos, Maelduin, Cyclops, Gargoyle and Deathgoyle are also lacking in battle animations and use the Transporter map sprite as a temporary map sprite. They do, however, have their weapon ranks set up and can use weapons. Gorgon Eggs are partially implemented. They again use the Transporter tent map sprites. For the turn-by-turn HP increase until they hatch, the game appears to use a modified Poison status condition to facilitate this, complete with the Poison sound effects when the HP increase is happening; however, they never actually hatch, and merely continue to try to increase HP every turn until they are killed. They are also the subject of a bizarre glitch - whenever the HP increase happens, the last player unit to be highlighted is moved on top of the egg, rendering the unit unusable. Gorgons themselves use the map animations of the female Druid as a placeholder. Their placeholder battle animation is a curious matter subject to variation depending on the map being played - some render them as having no battle animation, while others give them the male Druid animation. They have access to both dark magic and the Flametongue weapon used as a placeholder for some monsters. For the most part, the prototype's item list seems identical to the final release of Fire Emblem's, the only newly implemented items seem to be the Stone Shard, which uses Flametongue's icon, and Stone. All spells like Ereshkigal are present, functional, and have their animations. The emblem weapons (Emblem Blade, Emblem Axe, Emblem Lance) default to the name (Japanese: マーク). Revenants and Entombed wield the Stone Shard (Japanese: 魔石のかけら Dark Stone Fragment), a placeholder weapon which is still present as an unused item in the finished game. Unlike in the finished game, the prototype's Stone Shards reuse the Firestone/Flametongue icon from The Binding Blade and The Blazing Blade. Its stats are unknown, and it functions in the same way the monster weapons do in the final product. It also has a proper help description "A stone that monsters draw their strength from." The Stone 'tome' is partially implemented, it uses Flux's icon and is D rank dark magic. Despite the petrification status effect existing, the Stone tome is non-functional and will cause an error screen if a unit attempts to cast it. Flametongue still exists, wielded by the Gorgons and Draco Zombies present in the incomplete Chapter 19 (Eirika variant). Gespenst still exists, wielded by the Necromancer boss of Chapter 16 (Ephraim variant). The prototype's preliminary "map clear" splash. Cutscenes do not have any musical accompaniment. The Binding Blade Data Transfer functionality from Fire Emblem is still intact and available from the Extras menu. It is unknown if anything happens if one attempts to actually use it, considering that its purpose was to skip Lyn's story and unlock the extended epilogue. The branching promotion system is fully implemented. Interestingly, pressing right on the class selection screen will cause the unit to execute its normal battle animation; this easter egg was not retained in the final version. The vast majority of enemies are at Level 2, and have only the minimum stats for their class. This includes weapon ranks, so often one will find that bosses of the incomplete later chapters have been given powerful weapons which they are unable to use. Most chests in the game contain only Iron Swords; the ones which don't are all in Chapter 3, and they instead have a Slim Sword, a Steel Sword and a Silver Sword as well as a fourth containing an Iron Sword. Chapter 8 contains one extra tutorial event: Kyle comes holding a Knight Crest, and much like Wallace in Fire Emblem, selecting him for the first time causes him to point out this fact, then a help window comes up explaining class changing. If inflicted on a unit with the L debug menu, the Petrification status effect is partially implemented. It grays out a unit on the map and makes them unable to move, however, the in battle effects, the +30% enemy critical bonus and the unit's gray palette change are not implemented. It should be noted that the quick debug menu for units is unable to inflict this status effect on units, presumably due to a glitch, as the game softlocks when the player scrolls past the berserk status effect. There is also a effect named -- with a blank help description, if inflicted, the unit begins to function like the unfinished Gorgon Eggs in the test map and at Neleras peak. Sick is present in the prototype, it is before the "--" status effect, like in the final release, it doesn't seem to actually do anything. The world map system is the most complete part of the prototype, and is the only instance in the game where Sacred Stones-specific HUD graphics are already implemented. The map itself is nearly identical to the finished version, but is more desaturated and has a slightly different south-eastern coastline. All locations on the map are set up as they are in the finished game, although with slightly altered placements and paths, and the item management and chapter-entry mechanisms are functional. Some locations (not all from the finished game) have shops set up, but all have the same inventory: the armory only sells Wind Swords, and the vendor only sells Ocean Seals. Two minor presentational differences exist from the final game: rather than using one piece of music for all matters on the world map at a given point in the story, the prototype uses two: it uses the Fire Emblem theme "Friendship and Adventure" for doing things like moving around and swapping items, and uses "A Hint of Things to Come" for when the map cutscenes are started by travelling to the next destination. When saving, as opposed to being referred to as having saved in the chapter the player will proceed to next, save data for on the map is given its own label. Skirmishes spawn on the world map as they normally do and have a functional opening animation, but entering a skirmish just redirects the player to that location's original chapter with no changes, aside from the addition of the ability to retreat. If playing through the prototype normally, the world map cannot be accessed after Chapter 8. All locations after that point can be navigated and visited if the game is started and saved in the world map mode. The map's layout is mostly similar to that of the finished game and features only one additional point, but the majority of place names are completely different. Demon Forest This location, which is an early form of the Chapter 20 map, was merged into the Black Temple location in the final game. A magazine article from an undefined point in 2004 shows off many elements from around this stage in the game's production. The battle and character profile displays are still mostly those of Fire Emblem, a large focus is given to the movement of Eirika's preliminary battle sprite in the top-left, and the preliminary battle sprites of the Bonewalker and Revenant are shown in the bottom-right collection of images of Franz and Gilliam. It does, however, sport some substantial differences from this prototype: by the point of the build this magazine covered, Natasha and Joshua had been given portraits, L'Arachel had been redesigned into her final appearance, and Moulder's portrait had been adjusted into its final incarnation. It introduced battle sprites for the Elder Bael and Mauthe Doog, which didn't exist in the leaked prototype; as far as can be identified given the scan quality, these battle sprites look like the final sprites. Also, the background of the character profiles has been changed; though it doesn't resemble the final incarnation for character profiles, it does look like the scrolling background of most other menu panels. It can be concluded that this profiles another early build of the game, but from a slightly later point in development. For some reason the L shoulder button backs out of the options menu like the B button, the final release does not have this feature. Early revision of the revenant animation in action. Early revision of the bonewalker animation in action.